Your home. Your neighborhood. Your future. BMAV is here to help. Do you need a ride to a doctor’s appointment or someone to climb on a ladder to change a light bulb or for simple repairs? Would you like a friendly visit? Just ask! We have volunteers willing and able to help. Call us at 240-630-2628 or send us an email. Asked why he became a member of Bethesda Metro Area Village, Ben Beach said, “…because I'm very fond of my neighborhood and neighbors and became a fan of the aging-in-place idea a few years ago while watching a TV news story about the one on Boston's Beacon Hill.” He and his wife have lived in their present house since 1984. Running has been central to Ben’s life since he was a teenager. Back then, he wanted to be a pro athlete, maybe a shortstop, but, he said, “I didn’t get big.” He tried running, found he liked it a lot and is still doing it. 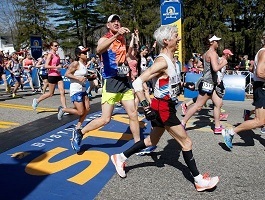 In fact, he just ran his 50th consecutive Boston Marathon on April 17. Click here to see a Boston Globe video of him after crossing the finish line (scroll down until you see Ben’s name). Ben also has run in all 45 Cherry Blossom 10 Mile Runs and participated in several Marine Corps marathons. And he recently got his wish to play baseball like a pro. On April 16, he threw out the first ball at a Boston Red Sox game. Ben’s made a name for himself in our area, too, as evidenced by two recent articles that appeared on in The Washington Post and Bethesda Magazine. Participating in marathons for so many years is remarkable enough, but it is even more so when you consider that since 2002, Ben has had an awkward running gait due to his dystonia, a neurological movement disorder that doesn’t allow his left leg to fully extend. He’s is in a clinical trial at NIH, where he gets Botox in his leg every four months. It helps, he says. Ben wants more people to know about dystonia, which most commonly affects the hands or arms and often is related to repetitive movement. He says the Dystonia Foundation is a good resource for those who want to learn more. The career side of Ben’s life has been in journalism, starting in high school. He worked for 27 years as editor of Wilderness Magazine for the Wilderness Society, then at the State Department and now is a freelance writer and editor. Ben has other passions besides running. One is recycling. He’s an outreach volunteer for the county, describing to community residents how they can recycle to improve our environment. Another is Bikes of the World, an organization that collects and ships donated used bikes and bike parts to countries around the world, primarily in Africa and Central America. At that end, the bikes are given to low-income people, including students, to improve their lives. Ben acts as a drop-off point for the bikes. Finally, every other Sunday he volunteers for Washington Ear by reading the Washington Post to the blind by phone. Once he retires, Ben says he’d like to do even more volunteer work, writing for organizations’ websites or helping in other ways. March 19 speaker series. 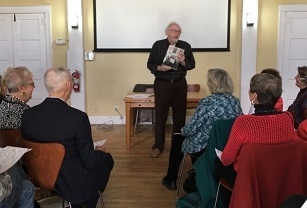 Speaking before a capacity audience, local historian William “Bill” Offutt gave a fascinating presentation, “Bethesda and Beyond,” on the history of Montgomery County and Bethesda. Offutt is author of Bethesda: A Social History and Seth, a novel based on his family history going back to pre-Revolutionary War days. Offutt’s talk took the audience from the settlement of the county in the 1700s to the arrival of Metro. He noted that the earliest settlers were mostly slave-owner tenant farmers from the South or from Pennsylvania and anti-slavery. During the Civil War, about one-third of them fought on the Confederate side. After the Civil War, the same families who had been in power in the county stayed in power, minus their slaves. According to Offutt, most of the early farmhouses occupied by tenant farmers after the Civil War were “not worth anything.” When the farmers moved away, they took out the window glass and nails and then set fire to the houses. Offutt showed slides and told stories about some of the more substantial buildings from those days that still. His audience also learned about several important figures in local history, as well as the impact of the arrival of NIH, Bethesda’s largest employer, which led to significant changes in the area following World War II. April 9 social. 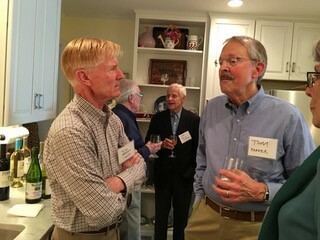 About 25 BMAV members gathered at the home of BMAV member Tim French on a lovely afternoon to sip wine, nibble on snacks, chat with one another and admire Tim’s beautiful mementos from his various Foreign Service postings. His garden, too, was a visual feast. Everyone wore a nametag that included his or her street name to promote conversation among those who discovered they were neighbors. Asked why Tim agreed to host the social, he said, “Having been invited to a number of other members' homes, I thought it would be nice to reciprocate. It was a very easy event to host, people seemed to have a good time, and I'm glad I did it.” If you’d be willing to host such an event, do get in touch with us. April 18 BMAV FUNdraiser at Lebanese Taverna. We had a good turnout, lively conversation and delicious food. We extend our thanks to Lebanese Taverna for being the first downtown Bethesda restaurant to support BMAV. Do you know of another restaurant that might be willing to host a fundraiser for us? If you do, contact us. April 19 Go4Life /Fit4Function presentation. A representative of the National Institute on Aging presented a program to a group of BMAV members about exercising in order to maintain the ability to continue doing the things needed to maintain strength, balance, flexibility and endurance. The presenter emphasized that we should start with small steps that we can do easily at home, so that we develop the habit of exercising, then increase the effort as we achieve our initial goals. If you were unable to attend the meeting, check the Go4 Life website for a description of the program and how to request the DVD and other helpful free materials. Wednesday, May 3, free docent-led tour of the gardens at the Hillwood Estate, Museum and Gardens. Wednesdays, May 3-June 7, 1:30–3:00 pm, memoir-writing class at Live & Learn Bethesda, Bethesda-Chevy Chase Regional Services Center, 4805 Edgemoor Lane, 2nd floor. Fee: $95. You can Live & Learn website or by calling Live & Learn at 301-740-6150. Parking is available in the county garage under the building ($1/hour). 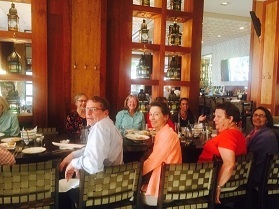 After the classes end in June, BMAV members who wish could continue meeting as a special interest group. Contact the BMAV office if you’d like assistance in registering or are interested in joining a memoir-writing special interest group. Tuesday, May 16, 1–2 pm, art gallery tour at Iona Senior Services. Iona's permanent collection features donated artworks by well-known artists such as Willem de Looper and Arlene Raven, and participants in Iona's own programs. This tour for BMAV members and friends also will include a special exhibit of textiles, works by Lauren Kingsland and ceramics by Liz Lescault, and, possibly, Q&As with the artists. Location: 4125 Albemarle Street NW, DC, one block from Tenleytown Metro station. Metered parking is available around Iona. Contact us to RSVP and for carpooling information. Thursdays, May 18 and June 22, senior cinema at the Avalon. Coffee at 10 am, first-run movie ($5) at 10:30 am. Name of the movie announced a week before (call 202-966-3464). If you’d like a ride or can offer one let us know. Monday, May 22, 7 pm, speaker series. Ken Hartman, director of the Bethesda-Chevy Chase Regional Services Center and County Executive Ike Leggett's representative for our area. Ken will talk about what’s going on in and around Bethesda, what’s on the horizon in terms of development, transportation and other issues great and small. This is the perfect opportunity for you to ask those questions that have been on your mind but you didn’t know whom to ask. Ken is sure to be able to answer them. Join us! Location: BCC-Regional Services Center, 4805 Edgemoor Lane, 2nd floor, rooms A & B. Parking is available in the county garage under the building ($1/hour). If you need directions to the building or how to get to the center after you’ve parked, or want to carpool, contact us. June 14, 10:30 am, visit to the National Museum of African American History and Culture. Timed-entry passes area are available for the first 12 BMAV members who RSVP to us (contact information below). Transportation can be arranged. Sunday, June 25, 4 pm, speaker series. Margit Meissner, Holocaust survivor, Holocaust Museum docent, educator, author, world traveler and speaker extraordinaire. Margit will recount her early years in Vienna, Prague and Paris, how she escaped from France when it fell to the Nazis and her very eventful life since then, including her ardent advocacy for children with disabilities. In fact, in 2003 MCPS presented her with a Distinguished Service Award and named her “Pioneer Individual” for having made a significant impact on the successes of special education curricula in Montgomery County. You won’t want to miss this event. Location: Battery Park Community Club, 7908 Glenbrook Road. If you have an idea for an event, speaker or want to host a small group for a morning coffee, afternoon tea or happy hour, let us know and we’ll help you set that up. Aging, dying and death. The next meeting is Sunday, May 21, 4-5:30 pm, at the home of Chris Palmer. Ann Mitchell, president and CEO of Montgomery Hospice, will discuss her work and that of her organization. Then, David Gerber, who lost his wife Ryna about 20 months ago, will talk about what he went through and what he learned. He and Ryna used the services of Montgomery Hospice and found it outstanding in every way. For more information, contact Chris at 202-716-6160 or palmer@american.edu. Birding. David Moulton leads early morning neighborhood bird walks about twice a month. Contact him at moulton.davidh@gmail.com for more information or to be added to his list of walkers. Bridge. Contact Susan Gross at susan.w.gross@gmail.com for more information. Fit4Function fitness. Meetup for fitness activities. We’re looking for a chair for this group. Contact us if you’re interested in joining or leading it. Knitwits. Get together to knit together. Contact Hanne Caraher, hcaraher@verizon.net. Yoga. Meets Mondays, 10:30 to11:30 for fee-based classes. Contact Elyse Jacob, elysejacob@gmail.com. Genealogy. Do you want to learn more about your family origins or the whereabouts of long-lost cousins? If you’d like to become part of a genealogy group or you have genealogy experience and would be willing to help guide other interested BMAV-ers, please let us know. After successfully getting BMAV to the next stage, executive director Meredith Bowers has left us to move on to other interests. To ensure a smooth transition, she worked closely with incoming executive director Elizabeth Haile. We extend our heartfelt thanks to Meredith for all she did and wish her success in her future endeavors. We’d like you to know a little about Elizabeth. She’s a graduate of Georgetown law school and has a long dedication to community service and social justice issues. She moved to Bethesda from DC with her family four years ago. She says, “I am so impressed with the work that has been done to launch BMAV and the time and dedication of the volunteers. I look forward to working on new outreach, services and support and getting feedback from BMAV members as we grow.” Welcome, Elizabeth! You can reach her at DirectorBMAVillage@gmail.com. Now that the village is up and running, the BMAV board of directors is changing from a working-board model to a governing-board model, shifting day-to day controls to the executive director. All committee chairs have been invited to serve on the board. Elizabeth is working closely with committee chairs to operate BMAV. Photographer. We still need someone to take informal photos – by cell phone is fine – at our events to enliven our newsletter and website. If you’d be willing to do that, we would be very grateful. Development/fundraising. This is a priority of the new board. The development committee will identify and contact area merchants and foundations as potential donors, and we’re on the lookout for someone who has experience with development and fundraising to lead that effort. Member outreach. Would you like to spend a lovely afternoon walking around our neighborhood? You are invited to join members of the membership committee as they canvas specific houses for outreach. Services. The services committee is looking for more members to help determine which additional services we should offer next to full members. Please let us know in which of these ways you’re are interested in helping or what you’d like to learn more about. Only with your help will BMAV be the useful and thriving village that we all want! 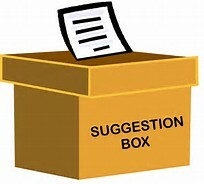 Do you have an idea for an article, a suggestion or question about BMAV or our community you’d like to see included in the newsletter? Contact newsletter editor Lynn Barclay at barclaylg@earthlink.net or 301-320-4962.